*** The other night, we hear the following over the monitor : "Pulco, taco, meat, rice" This kid's hungry all the time these days and he LOVES El Acapulco. Every time the waiter comes by he says "rice, beans" and when he gets his food, he cleans his plate! Hayden - "Mommy, like it, shirt"
Me - "Thanks, Hayden. That's sweet. Now it's time to go to sleep." H-"Mommy, like it, Mommy's shirt"
Me - "Thanks, Buddy, now close your eyes and go to sleep." H- "Hobby Lobby . . . Chuck E. Cheese"
Now, what is going on in that little head of his? I promise I feed him, but he's always talking about food. He woke up the other morning and said "strawberries" the minute I walked in his room! ***Nanny asked him where he wanted to go eat as we were driving. We expected "pulco" (El Acapulco), but without hesitation, Hayden said "Burger King!" He's only been there once before, so I'm not sure where that came from! ***The other day as I was driving, Hayden randomly yelled "Roll Tide!" from his carseat. It's been a while since he's heard that, so it cracked me up that he would think of it. My brother goes to the U of Alabama, so after he said it we started talking about Uncle Eric. Now when he sees Eric's picture, I ask who it is, and he answers "Roll Tide!" Sorry Eric, I guess that's your new name! Sorry for the long post, I just had to share the conversations we always get a good laugh out of at our house...now I'll leave you with a picture. I asked Hayden to carry his diapers to his room, and this is what I found when I went to check on him. 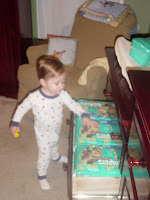 He knows I keep diapers in one of his drawers, so he opened a drawer and got all the packages to fit inside. You're such a great helper, Little Man! Ooh, I love El Acapulco. I probably talk about it in my sleep, too! Coach Online Store, to the opposing fretting hand, a handful of will be listed below: private coach Eden Shopper : Its a good realistic designer purse that is going to potentially often be do not very nice but nevertheless offers the easiest way with design and style. chenjiansu1026.